Classes that Meet your Needs and Your Schedule! 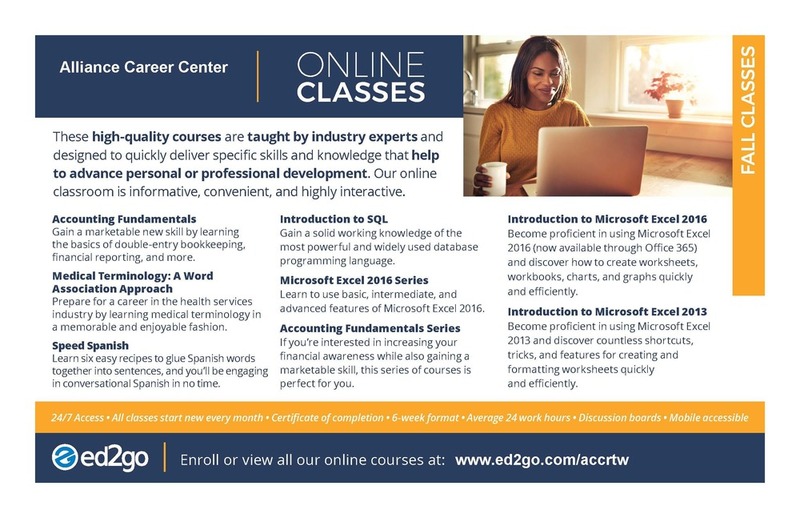 Alliance Career Center, in partnership with ed2go, offers online open enrollment programs designed to provide the skills necessary to acquire professional level positions for many in-demand occupations. Our programs are designed by a team of professionals from each respective field, providing you with effective web-based learning programs. Instructors/mentors are actively involved in your online learning experience. We offer a wide variety of programs that range from 6 weeks to 18 months including CompTIA, SAT/ACT Prep, Accounting, Microsoft Office, Adobe and much more!